Top and above Sacha Baron Cohen, in character as Adm Gen Aladeen, promotes The Dictator with models Elisabetta Canalis and Sasha Volkova. 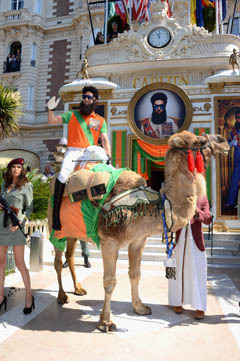 The hijinks at the Festival de Cannes kicked off with Sacha Baron Cohen promoting The Dictator, in character as Adm Gen Aladeen of the fictional republic of Wadiya. 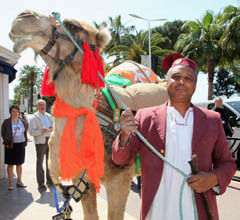 Cohen’s publicists sent out notices of a photo call at the Carlton Hotel for Cannes Film Festival yesterday, where he, as Aladeen, appeared with a camel and his now trade-mark female bodyguards, delighting crowds. He attempted to ride the camel—which he called Oussama—but fell off. Later, with model Elisabetta Canalis, he enacted a scene on a luxury yacht at the Hotel Du Cap, where the pair were first seen to enjoy themselves, before getting into an argument. Canalis was led below deck by Aladeen’s “people” and a body bag was later dumped off the side of the craft. The media were encouraged to cover the events as though they were with real celebrities—certain past liaisons, especially with royals, off the Côté d’Azur come to mind. Canalis was, of course, later spotted on the Riviera enjoying herself. Finally, in the third event of the day, Cohen appeared once more as Aladeen for a function, this time in another Lamborghini Gallardo Roadster—but not, as at the London première, on the back of a truck after having been clamped. He was accompanied this time by model Sasha Volkova as he went to Canal Plus for Le Grand Journal. Cohen’s wife, Isla Fisher, was at an earlier press conference for Rise of the Guardians.